Corsair Glaive RGB Gaming Mouse Review, An Ultimate Ergonomic Design? I’d like to post a Corsair Glaive RGB gaming mouse review because I have been using this mouse for a while now and it is better than I first thought it’d be. Although the first thing you’ll notice about the Corsair Glaive is the high price point, it backs it up with features and build quality that is hard to find in a lot of gaming mice on the market today. 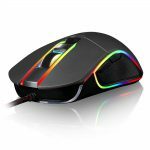 Motospeed V30 Review, A Cheaper RGB Gaming Mouse? Let’s review the Motospeed V30 which looks to be one of the best gaming mice on the market if you’re looking to spend $20 or less. Usually when you start going into the lower end markets, especially for RGB perihperals, you get what you pay for and $20 just for a mouse from a brand name that isn’t well known, you shouldn’t expect much. Or should you? This mouse is actually a nicer quality mouse for what you pay for which isn’t something you see every day!